On June 14, 2012, as part of the United Way’s Day of Caring Campaign, Chris Lancaster (Bristol- Plant Manager), Rhonda Tucker (Customer Accounts Manager- Bristol), Lisa Wilson (Payroll Administrator-Bristol), Melissa Harrison (Fabrication Sales Estimator- Bristol), Jami McFalls (Staff Accountant- Bristol ), Randy Montgomery (Manager of Project Management & Detailing- Bristol), and Shannon Lambert (Maintenance- Bristol) delivered benches and picnic tables made of FRP material to the Children's Advocacy Center (CAC) of Bristol/Washington County. 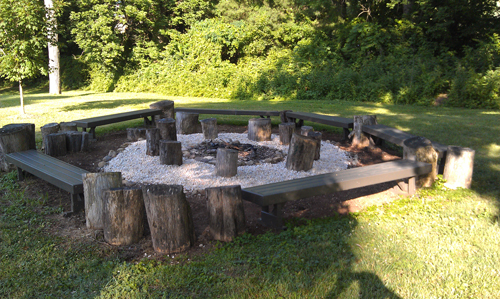 The benches and picnic tables were produced and fabricated by our own pultrusion operators, painters and fabricators. Previously, the CAC had wooden benches and picnic tables which needed repeated maintenance and eventually were destroyed by a storm. These FRP benches and tables will offer multiple years of maintenance free service to ensure that the CAC continues its mission to provide the safest environment for facilitation practices in the field of child abuse prevention, treatment, investigation and prosecution. During their visit, they also helped with the set-up of their upcoming “Goofy Olympics” day camp. Strongwell does not just provide better solutions to traditional materials; our employees make a difference in our community as well!